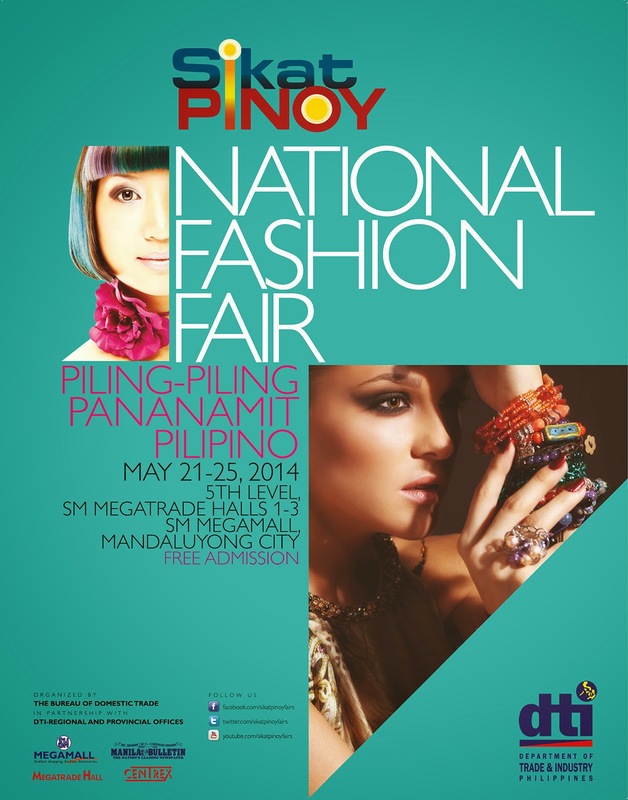 The DTI-Bureau of Domestic Trade holds the Sikat Pinoy National Fashion Fair with the theme "Piling-Piling Pananamit Pilipino," which will be held from May 21 to 25, 2014, at the SM Megatrade Halls 1-3 at SM Mega Mall in Mandaluyong City. With 60% of total exports coming from MSMEs (micro, small and medium enterprises), it is important tor the department to provide marketing support for these entrepreneurs so they could reach a wider domestic market and eventually become globally competitive. Fashion pieces ranging from handcrafted accessories, to intricately woven fabrics and unique apparel from MSMEs across the country’s 16 regions will be showcased at the event. About 150 participants are expected to display their wares in different fashion categories, such as clothing, apparel and other wearables, footwear, leather goods, bags and accessories, jewelry, health and wellness products, etc. Among the event highlights will be a fashion show of bridal gowns using indigenous raw materials, to be held as part of the formal opening on May 21. The Cebu Fashion Accessories Manufacturers will display their export-quality costume jewelry and fashion accessories in a special setting. For those looking for more traditional craftsmanship, the Ilocos region will also have their own pavilion to showcase the work of the MSMEs from Region 1. Fashionistas looking for that unique, one-of-a-kind item that can make you stand out at special occasions should grab this rare shopping opportunity. Homemakers on a budget will also be able to get some great bargains, especially for the coming school opening. Even trendy hunks will surely be able to find an interesting accent piece or accessory to jazz up their daily office outfits. To encourage aspiring entrepreneurs, Awareness Seminars are being offered FREE of charge. The Bureau of Internal Revenue will hold a seminar on BIR matters and the duties of SMEs as responsible taxpayers on May 22 & 23, from 9:30 – 10:30 AM. Those interested in venturing into Online Marketing can attend the seminar by Air21 Global on May 24 & 25, from 9:30 – 10:30 AM. There will also be training demos during the event. For more information, contact the DTI-Bureau of Domestic Trade at telephone no. (632) 751-3223, fax no. 751-3224, or email bdt@dti.gov.ph.